This inspiring new film takes us to a place…a place where the healing power of music transcends Alzheimer’s, loneliness, and confusion to usher in a sense of happiness and belonging. 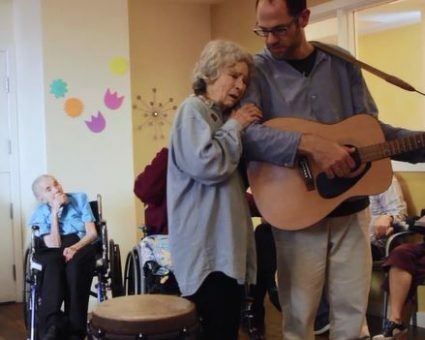 The film follows singer-songwriter Lior Tsarfaty as he visits Alzheimer’s care communities and engages the residents in music, song, and dance. “Your heart is a reminder that you are not alone,” he tells one group, “You are connected to other hearts, and other hearts, and other hearts, and other hearts. And we are all beating together, just like a big, big drum.” And the residents smile, and sing, and play instruments, and dance–and belong to that particular moment. Caregivers will be encouraged to boost the overall quality of life for persons living with Alzheimer’s through the inclusive and engaging power of music and movement.